· Vikramshila has conducted an early childhood development course ECL (early childhood learning) for 300+ teachers, over 12 years with the B. Ed department of St. Xavier's College from 1993-2005. The course curriculum covered Montessori, class 1 and class 2. Many of the participants of the training (a one-year course) started their own ECE schools or joined different schools' pre primary sections. · Vikramshila's Director, Mrs. Shubhra Chatterji, eminent educationist in India, has been member of the Advisory Group of NCERT that worked on developing the Pre School Curriculum. She is presently a member of Advisory Group of Language & Literacy Programme of NCERT. As a technical agency in education, we have supported IGNOU by developing the Modules on Language and Literacy for their Advanced Diploma Course of ECE. 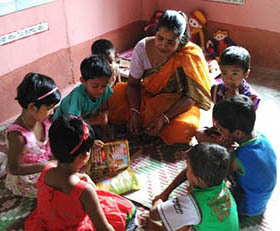 ECE in West Bengal - In its role as knowledge partner for Unicef Vikramshila has been providing support to the Department of Women and Child Development, government of West Bengal since 2011. 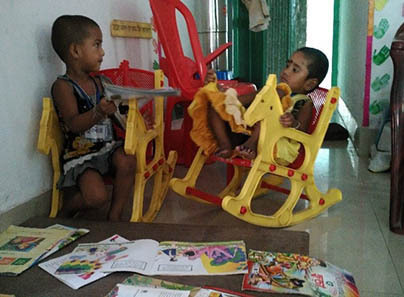 Vikramshila conducted a situation analysis of ECCE in the state of West Bengal in 2011. Following the findings of the study, the state underwent an intensive process of curriculum development. Vikramshila has provided technical expertise in finalizing the curriculum and a sample routine for 3-6 year olds, the Early Learning Development Standards, and in the capacity building and leadership development of a 400 member State resource Group on ECCE as well as the 1200 district level resource persons. More than 14,000 model centres have been developed so far across all the districts. ECE in Jammu & Kashmir - As technical partner of Unicef, Vikramshila played a key role (2016-2017) in the finalization of the new ECE curriculum, development of a corresponding set of activity books and a manual for training anganwadi workers and helped the state to develop the state strategy and implementation plan for setting up of Model Centres which are meant to be used both for the purpose of training and as quality hubs. As part of the capacity building effort, Vikramshila trained a resource pool of about 225 people comprising of AWWs, supervisors, CDPOs, AWTC staff and NGO workers. The focus of capacity development was on setting up model centres, demonstrating good ECE practices, and subsequent supportive supervision needed for effective implementation. ECE in Uttar Pradesh - As a technical partner of Unicef, Vikramshila is working on two levels – with the state where it is in the process of training up state ECE leadership (75 DPOs and 150 CDPOs) and doing intensive work at the Devipatan division (Gonda, Bahraich, Sravasti, Balrampur) to develop a ground level monitoring and mentoring system. In Devipatan, the plan is to form district level resource groups comprising of DPOs, CDPOs and supervisors and facilitate training of all 8291 anganwadi workers workers in the four districts. A total of 600 demsontration model centres are being set up as a strategy for scaling up and maintaining quality standards.As a technical partner of Unicef, Vikramshila is working on two levels – with the state where it is in the process of training up state ECE leadership (75 DPOs and 150 CDPOs) and doing intensive work at the Devipatan division (Gonda, Bahraich, Sravasti, Balrampur) to develop a ground level monitoring and mentoring system. In Devipatan, the plan is to form district level resource groups comprising of DPOs, CDPOs and supervisors and facilitate training of all 8291 anganwadi workers workers in the four districts. A total of 600 demsontration model centres are being set up as a strategy for scaling up and maintaining quality standards. Vikramshila's model of upscaling begins with a situation analysis, followed by sharing of the analysis and inviting expert reflections through national and state level consultations. The consultations lead to the preparation of a curriculum/resource package for the need that has arisen out of the situation analysis. The curriculum/resource package is field tested and then piloted in model centers/schools. This leads to experience sharing and consolidation of learnings at the state level. 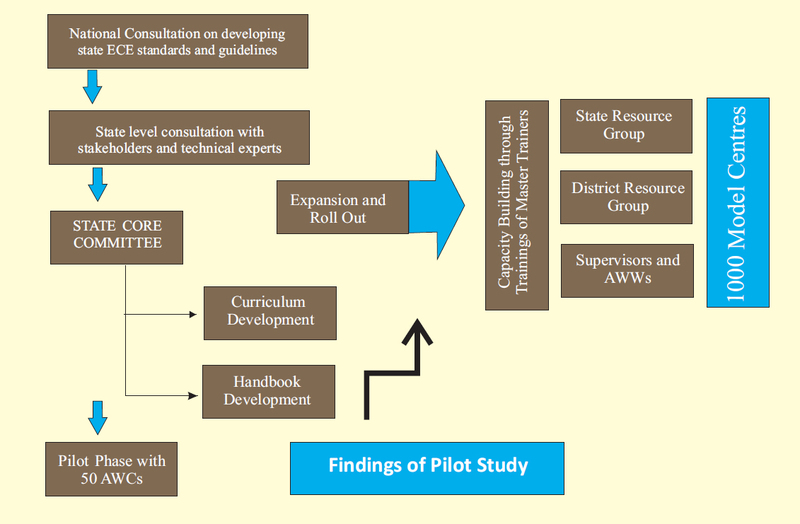 In collaboration with the state departments, state wide implementation plans are designed and resources prepared to ensure standardized implementation across all districts. Monitoring frameworks, tools and processes are developed that facilitate the actual scaling up, which is done in phases. 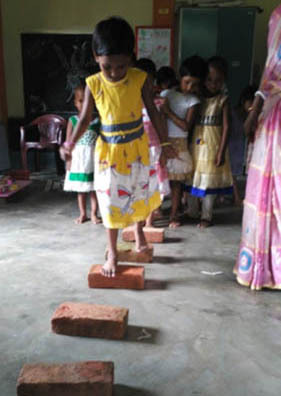 Given above is the blueprint of Vikramshila's upscale intervention model of strengthening Early Childhood Education, in collaboration with the Department of Women and Child development & Social Welfare, West Bengal.